Hold on – Mabel Normand clings to the roof of the Castle Towers Apartments in Mickey. Mabel Normand’s wildly popular 1918 feature Mickey climaxes with a thrilling roof-top rescue staged years before Harold Lloyd stunned audiences with his high-rise climb in Safety Last! (1923). 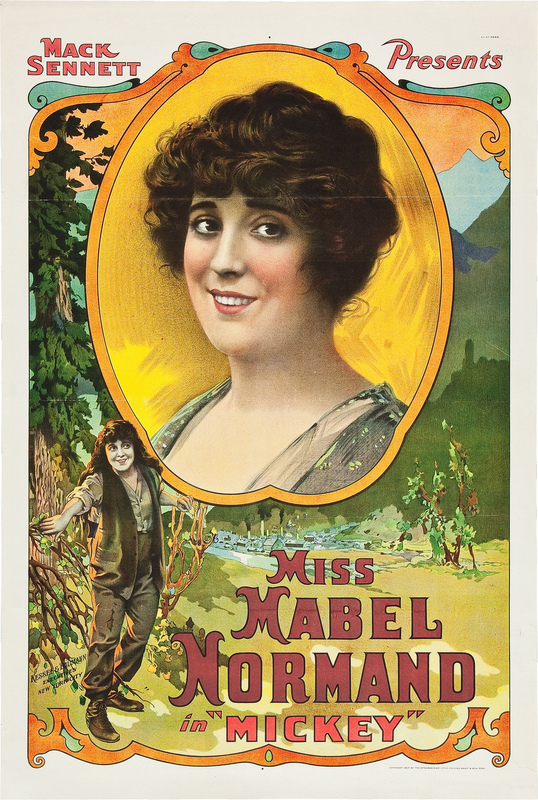 Reportedly the highest grossing film of the year, Mickey was the only film produced by Mabel’s independent studio set up for her by Mack Sennett. As shown in a prior post, Mabel’s early co-star Roscoe Arbuckle also beat Lloyd to the punch filming downtown rooftop stunts. Mabel plays the lead, Mickey, a nature-loving tomboy forced to live with her cruel, aristocratic aunt. The movie brims with real locations, including the aunt’s formal gardens, filmed at 4 Berkeley Square (Hal Roach’s neighbor), where Lloyd and other Roach Studio stars would film posh garden scenes for later comedies, and the equestrian race track that once stood at Exposition Park (years before the Coliseum opened in 1923). I hope some day to post several more stories about Mickey. Looks can be deceiving – seemingly matching wide and close views of Mabel’s rooftop climb? This rooftop scene fascinated me, but I had no idea where it was located. Seeking help, I posted the above movie frames to share on Flickr, and within minutes Los Angeles historian and OnBunkerHill.org blogger Nathan Marsak contacted me to identify the setting as the former Castle Towers Apartments, once standing atop Bunker Hill at 750 W. 4th Street, on a bluff running parallel to Flower Street. Mabel filmed using the Castle Towers. OnBunkerHill.org. Christina Rice. Christina Rice, Los Angeles Public Library Senior Librarian, biographer of Ann Dvorak, and fellow OnBunkerHill.org blogger, wrote about the building’s incredible story (see more below), once belonging to prominent resident Mira Hershey. The chocolate family heiress and one-time owner of the famed Hollywood Hotel is perhaps best remembered as the benefactor of UCLA’s first on-campus dormitory Hershey Hall, that still bears her name. The back of the Castle Towers which faced 4th Street where it ended at a bluff overlooking Flower Street. This detailed image is but a tiny portion of a giant sweeping panoramic image taken in 1930. USC Digital Library whit-neh-71421. Given the off-kilter orientation of downtown (the streets run NW-SE and NE-SW, 45 degrees from true north), the orientation of the building along the Flower Street bluff means that the wide view (right below) runs SE towards the flat area of the LA basin. Since the wide view and close-up view of Mabel seem to match, the close-up view should also look to the SE where it is flat. Yet the close-up shot seems to look north to the Hollywood hills instead – how could this be? I wondered – if the opposite corners of the building were identical, Mabel could have filmed her wide view to the right, and her close-up at the safer position to the left. 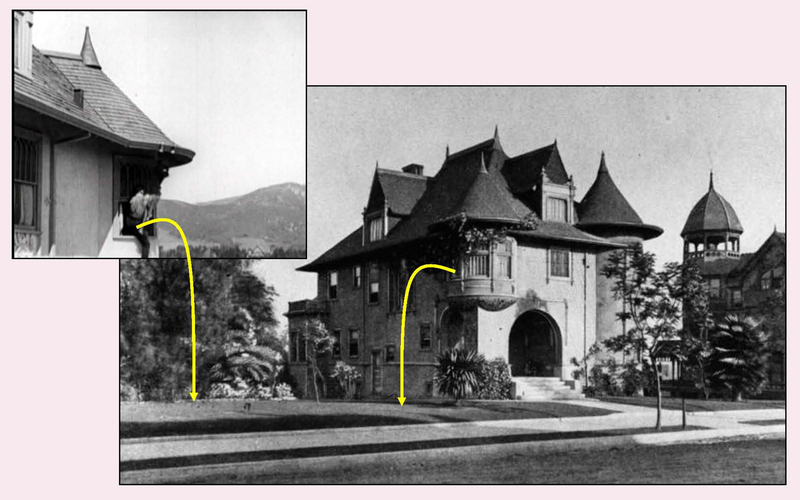 As Christina reports, the Castle Towers was originally the private home of Mira Hershey, facing Grand at the NE corner of 4th Street as shown below. Incredibly, in order to transform her home into an apartment building, Ms. Hershey had the home cut in two, rotated clockwise 90 degrees, moved two blocks west along 4th Street to beside the dead-end bluff above Flower Street, and extended by adding a new middle section with two further dormers along each side. At its new location and orientation, a view of its front left corner would look nearly due north towards Hollywood. So what does this all mean? The answer is elegantly simple. As shown below, Mabel found a building with identical, opposite corner towers, one strikingly high off the ground, the other low to the ground, and presented the two towers as one and the same. In this way Mabel convincingly presented herself as in great danger while filming in relative safety. When Mabel climbed from the roof to the window, she filmed at the front left corner that was only one story above the ground. This view shows the Hershey home at its original location at 4th and Grand before it was cut in half, moved two blocks, and expanded with two further dormers along each side. LAPL. 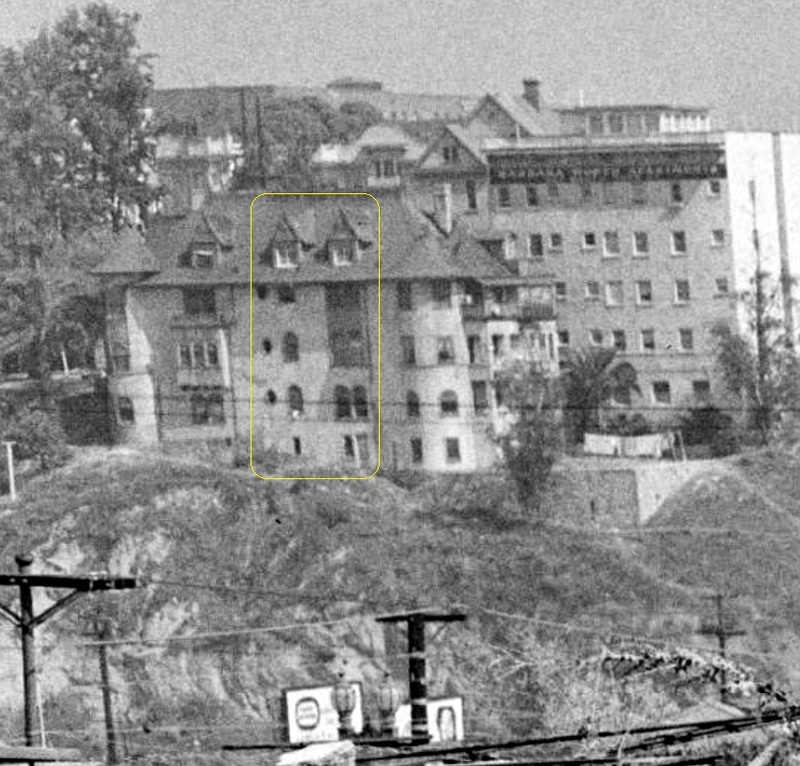 This rare side view of the apartment was taken in 1951 during the construction of the Harbor Freeway towards downtown. After the house was sliced in two sections, rotated, and moved to this location, it was converted into an apartment house with a new, extended middle section, marked by the yellow box. Behind it stands the former Barbara Worth Apartments. 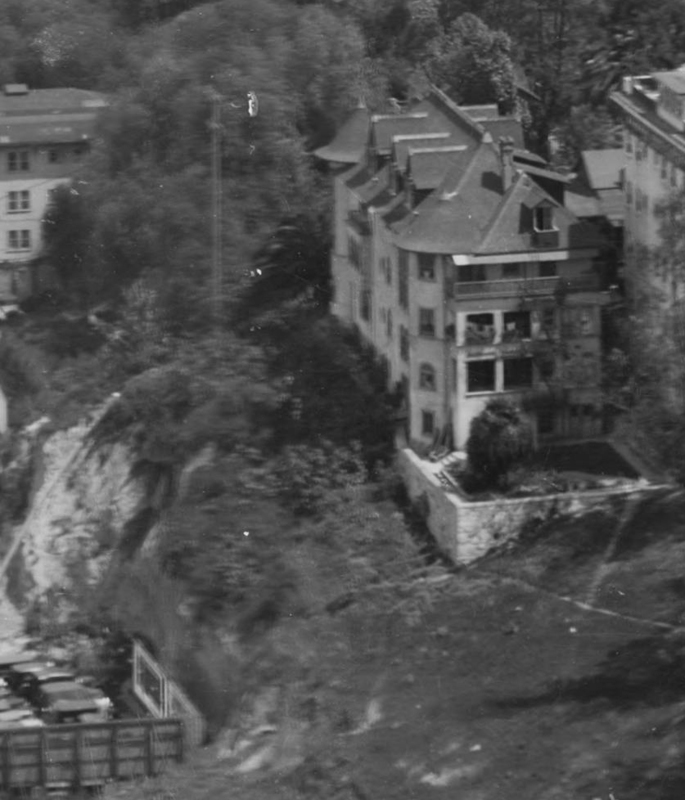 Comparing a 1923 image of the hillside (left) – LAPL – to the 1930 photo, showing how the hillside along Flower Street was excavated, making way for a new building, gas station, and parking lot. 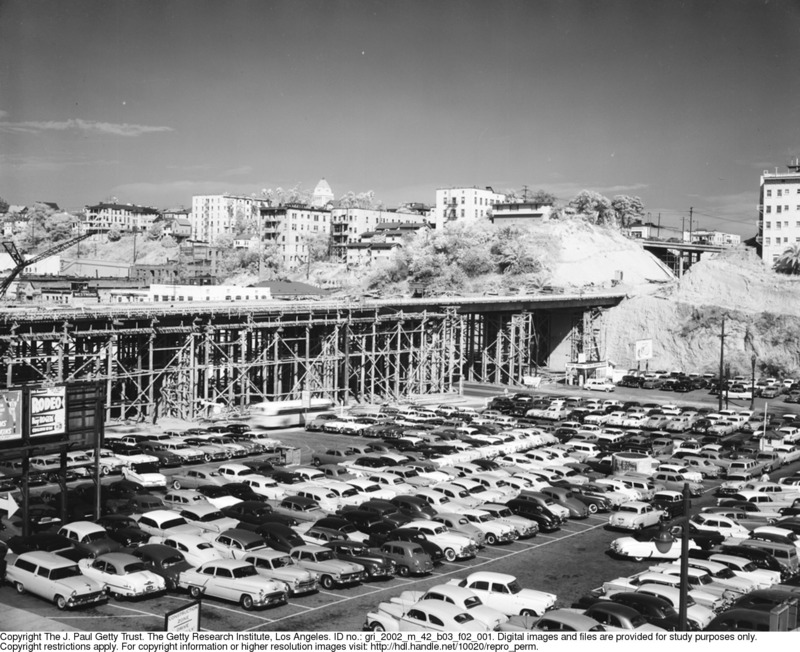 As part of the Bunker Hill redevelopment, a ramp along W 4th Street was built in 1955, swooping up from Figueroa, across Flower, excavated to pass below grade beneath Hope Street, and reaching the top of the hill at Grand, finally making W 4th Street a through street. By this point the Castle Towers was lost, but its neighbor, the Barbara Worth Apartments building (far right below), is still standing. The history of Los Angeles and of the movies are inexorably intertwined. Thanks to Mabel, we now have further views of a Bunker Hill landmark to enjoy, while thanks to the archivists who make historic photos available, we can appreciate nearly 100 years later how remarkably clever Mabel and the other early filmmakers were. We are also indebted to Paul Gierucki, Brittany Valente, and CineMuseum, LLC for restoring Mickey, and to TCM for broadcasting it for eager viewers to enjoy. A modern view looking up from Flower Street towards the former site of the Castle Towers Apartments, with the 4th Street ramp flying up the hill to Hope Street at back. 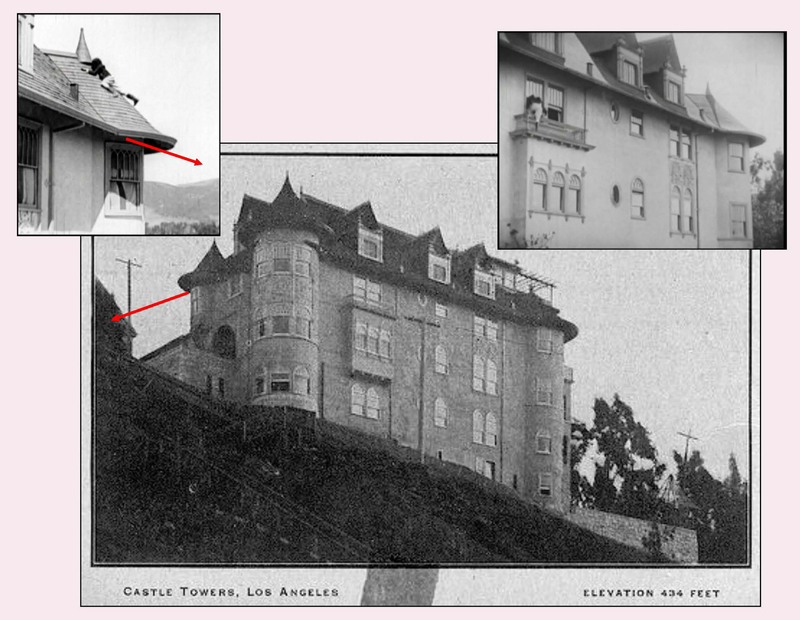 This entry was posted in Bunker Hill and tagged bunker hill, Castle Towers, Los Angeles Historic Core, Mabel Normand, Mickey, Mira Hershey, Silent Comedians, Silent Comedies, Silent Movie Locations, Silent Movies, then and now. Bookmark the permalink.